Hundreds of businesses have customers who admire them, but only an elite few have true advocates passionate, loyal, vocal fanswho rave about them to anyone who will listen. Jeanne Bliss, who served as a senior customer executive at five major companies, says there's no shortcut to becoming belovedyou can't hire a fancy marketing firm to get there. You earn it by how you decide to run your business… as Wegman's and Harley-Davidson have for decades and as relatively new companies like Zipcar and Zappos are doing right now. 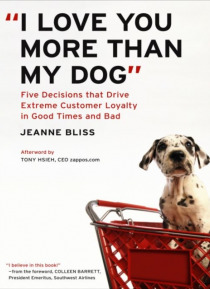 After studying and working with dozens of beloved companies, Bliss has identified five key decisions that lead to customer devotion: *; Decide to believe *; Decide with clarity of purpose *; Decide to be real *; Decide to be there *; Decide to say ';sorry' Her examples and advice will help readers sustain growth and profit even in a tough economy.